Published for the Diamond Jubilee anniversary in 1966, the book condenses some of the material found in the 50th anniversary book, and adds the next 25 years of history. The book includes many photographs, including photographs of all of the various classes and groups of the church in the anniversary year, as well as a historical list of all church members from its founding. Format note: The cover and title pages are included as JPEG images for preview purposes; to view the full book, click on the PDF document link. 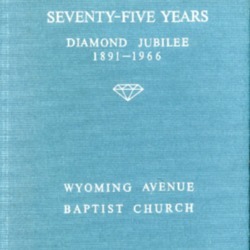 Beuerle, Elizabeth Hookway, co-editor and Whitehair, Arthur, co-editor, “Seventy-Five Year History, Wyoming Avenue Baptist Church, 1891-1966,” Wyoming Avenue Baptist Church Digital Archives, accessed April 18, 2019, https://omeka.wabcphilly.org/items/show/15.